One of Grant Aviation's two King Air planes sits on the airstrip at St. George Island. The nine-seat aircraft is flying a new route from Unalaska to St. George to St. Paul. St. George Island has a new air carrier. Grant Aviation won the community's Essential Air Service contract this fall, after PenAir decided to drop the route during its Chapter 11 bankruptcy proceedings. Residents of the notoriously hard-to-reach island are hoping the change will bring more reliable flights, but they're not sold yet on their new provider. KUCB's Laura Kraegel was on the first flight. Grant Aviation's inaugural flight to St. George Island is leaving about three hours ahead of schedule. That's worth noting as reliability played a key role in the federal selection process that sent a $1.8 million contract to Grant over two competitors. "We're going early because of the winds," says Grant President Rob Kelley. As we take off, Kelley tells me the airline moved up its schedule to beat an incoming storm expected to blow 60-knot winds or higher. "We'll be able to get into St. George," he says. "We will not be able to meet the PenAir flight coming into St. Paul." That's not ideal for the first run on Grant's new route, which goes from Unalaska to St. George Island to nearby St. Paul Island — and back again. But Kelley isn't too worried. He and I are the only passengers booked for the round trip, and the sole traveler scheduled for pick-up in St. Paul won't make it anyway because of weather. That leaves him to focus on the real goal of this debut flight: to smooth things over in St. George. "Making sure the community knows that we're going to do what we need to do to take care of them," he says. "That's why I want to meet with the mayor and try to answer any questions he may have." Kelley is expecting quite a few questions from Mayor Pat Pletnikoff. Concerns and complaints, too. Pletnikoff is waiting in a truck on the airstrip when we make it over the island's cliffs and touch down on St. George — current population: 62. "So you made it when it's nice! That's good," he says. "Maybe that portends what might happen in the future. Let's keep positive thoughts, right?" All positive thoughts aside, the drive into town is a little tense. Pletnikoff says inconsistent air service is one frustration among many in St. George, which struggles with low population, limited infrastructure, and a high cost of living. "I want my people to be taken care of," he says. "I'm tired of being treated like a mushroom. You know what they say about mushrooms, right? Keep them in the dark and feed them blank." During a meeting at the city office, Mayor Pat Pletnikoff (left) and other St. George residents speak with Grant Aviation President Rob Kelley (facing away). The mayor lays out his criticisms of Grant during a meeting at the city office, where about a dozen elders, tribal leaders, and municipal employees have gathered. He tells Kelley they were all hoping the contract would go to a different airline, given Grant's reputation around the region. A reputation for flight cancellations and poor communication. "We talked to people at Atka and Nikolski and Akutan. As you can well imagine, the news wasn’t good," he says. "People are pretty unhappy about the kind of service they've been receiving." Kelley says he gets that. But he's here to assure St. George residents that Grant is working on those issues. "We've had some struggles in the past," he says. "We changed the management." The airline has also replaced a plane that was damaged beyond repair last year in a belly-flop landing at Unalaska's airport. The pilot in that incident was dismissed, too. "We had one King Air for quite a while. We now have two," says Kelley. One plane is stationed in Unalaska, while the other stays in Anchorage. They'll be swapped during maintenance. "We have two pilots now," he says. "We only had one before. So we've got redundancy." Back at full strength with planes and pilots, he says Grant will be able to serve all of its destinations in the Aleutian and Pribilof Islands more reliably. It'll have the flexibility to adjust departure times to avoid bad weather, along with the manpower to make up for inevitable cancellations more quickly. "We want to meet y'alls needs," Kelley tells Pletnikoff. "If we fail to perform, it should only be because of weather." Pletnikoff replies: "That's good to hear." As the meeting wraps up, the mayor tells me he'd still prefer a different carrier. But he thinks Grant's visit has gone pretty well. "It's a beginning," he says. "We had our reservations initially. But after having this discussion, I think they're making every effort to be responsive. We've got to remain optimistic and work together and try to build it." The U.S. Department of Transportation — for its part — is confident Grant can fulfill its promise. In their selection letter, agency officials called it "a stable, mature airline with roots in Western Alaska," pointed to its investments in planes and personnel, and argued that any carrier would have reliability issues in the region's adverse weather. They also cited their financial responsibilities. Grant's proposal came in $1.6 million below St. George's top pick, Security Aviation, as well as $908,000 below the third bidder, Alaska Central Express (ACE). Despite the DOT's stance, St. George resident Olga Stepetin has her doubts about Grant. "We'll just have to wait and see what happens," she says. Stepetin tells me her hesitation stems from the new route out of St. George. Planes previously flew to St. Paul and Anchorage, but Grant is flying to St. Paul and Unalaska. That means travelers will have to book additional tickets if they want to get to Anchorage from either destination. And as St. Paul and Unalaska have weather issues too, Stepetin worries St. George fliers are just going to get stuck between two airlines halfway through their journeys. "Because [St. Paul and Unalaska] have a lot of people and fishing boats over there," she says. "And they have a tough time just getting their own passengers out." Grant is promising St. George that it'll match its schedules with those of Ravn Air Group, the company acquiring PenAir and taking over its flights between Unalaska and Anchorage, as well as St. Paul and Anchorage. 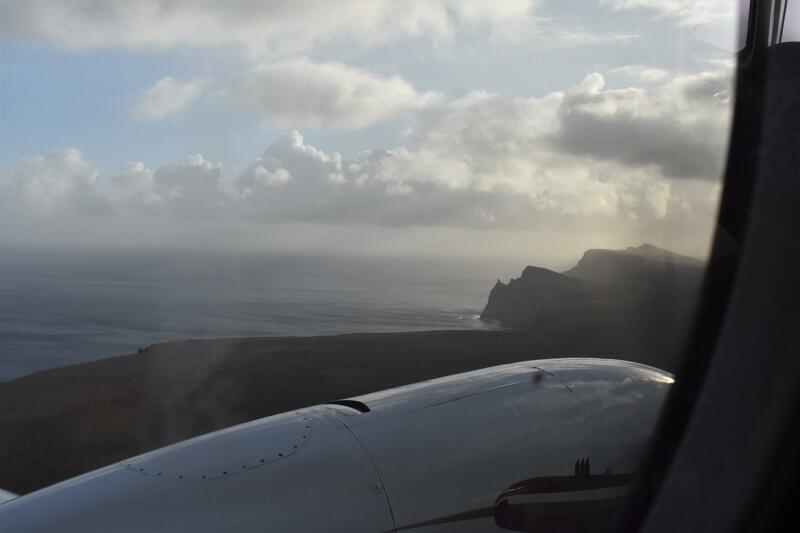 The flight from Unalaska to St. George takes between 45 minutes and one hour, depending on weather over the Bering Sea. 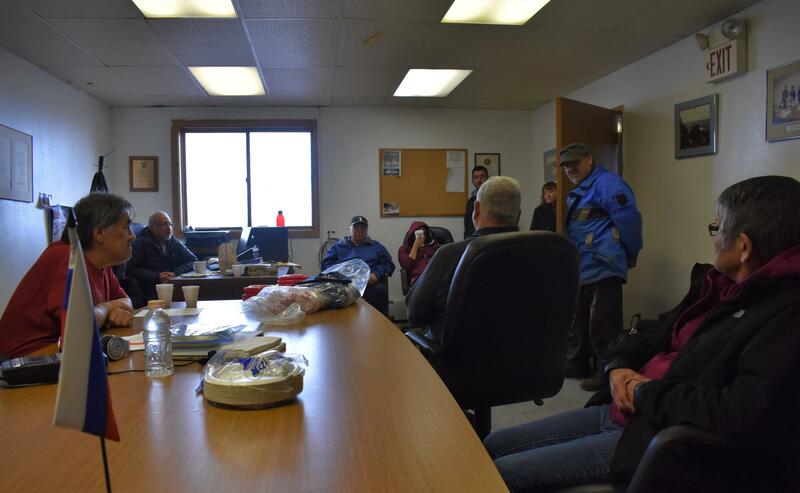 Grant is billing its separate route from Unalaska to both Pribilof communities as another option for travelers used to limited choices. And even with his reservations, Pletnikoff is pretty excited for direct flight to Unalaska. "There's no reason why we shouldn't have an exchange of people between Unalaska and St. George," he says. "You know, have our people visit more often. Sit down, talk about similar problems, and find out how best to address them." Still, Pletnikoff will be keeping a close eye on Grant — and Kelley. With St. George so reliant on air service, he says the community must hold the carrier accountable. "I have a list on my desk with company names and government agencies — the people I need to call to complain — and I'm going to put his name at the top of the list," says Pletnikoff. "Because I want to make damn sure that if we have problems, we get them corrected. Our people, for the most part, have done without. They're making the necessary sacrifices to keep the community alive, but they do need help." As we get back to the airstrip and prepare to board, Kelley says Grant is ready to provide some of that help. And he thinks St. George residents will be happy with the results once they wait and see. “I thought the meeting went well," he says. "I accomplished what I wanted to accomplish, which was to give them a sense that we're going to service their needs. I walked away thinking they understood that." Grant Aviation flies its new route on Wednesdays, Fridays, and Sundays. It's also offering an $25 one-way introductory fare. In 2019, the carrier is planning to switch to a standard one-way fare of $150 or $200. 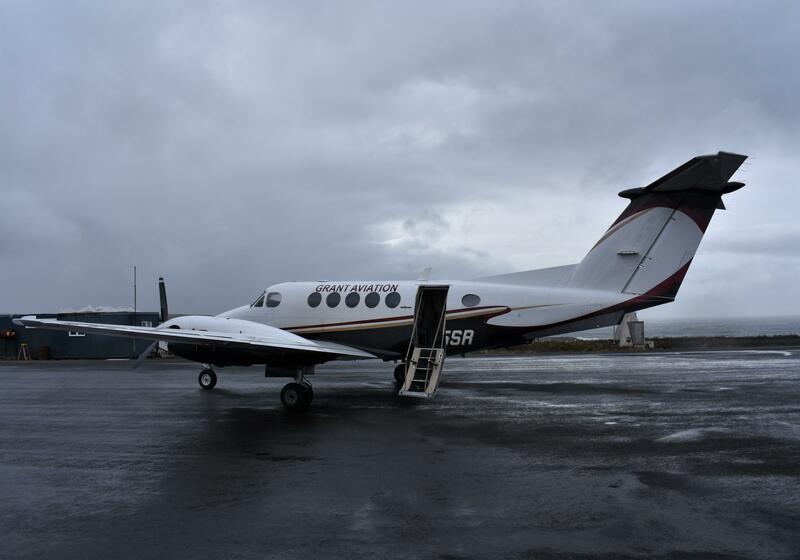 11/9/18: This story previously stated Grant Aviation had two King Air planes stationed in Unalaska. In fact, one is stationed in Unalaska, while the other stays in Anchorage. They'll be swapped during maintenance. The above story has been updated with the correct information. While students head back to class across Alaska, the school on St. George Island has stayed closed. District officials said it’s the latest casualty in a statewide trend where small, rural communities struggle to hold on to their kids. Seventy-five years after supervising the Unangan internment during World War II, the U.S. Fish and Wildlife Service has finally apologized to the people of St. George Island. Federal officials visited the island last month to make amends in person. Before a small crowd at the St. George community center, Wes Kuhns says the U.S. Fish and Wildlife Service (USFWS) is ready to take responsibility for its actions. St. George Island is waiting on an emergency water delivery after falling ice damaged the community’s reservoir on Monday. In St. George, water is stored in a 280,000-gallon steel tank that draws from an aquifer. The reservoir isn’t insulated, so when cold winds batter the island from the north, water freezes inside the tank, usually near the top. Mayor Pat Pletnikoff said that leaves ice hanging dangerously as the water level drops, like it did on Monday. St. George Island is taking steps to protect the marine environment in their backyard. The city council passed a resolution earlier this month that could establish a National Marine Sanctuary. Eighty people live on the island of St. George. They're primarily Unangan and they rely on ocean resources for subsistence. One of southwest Alaska's largest airlines will soon be up for sale. A federal judge has ordered PenAir be auctioned off this October — more than a year after the company filed for bankruptcy protection. The carrier is promising residents of the Aleutian and Pribilof Islands that their only connection to Anchorage won't just vanish. The Seybert family founded Alaska-grown PenAir in 1955, and they still own it today. The company includes 430 employees, 10 airplanes, and eight routes across Bristol Bay, the Alaska Peninsula, and the Aleutian chain.